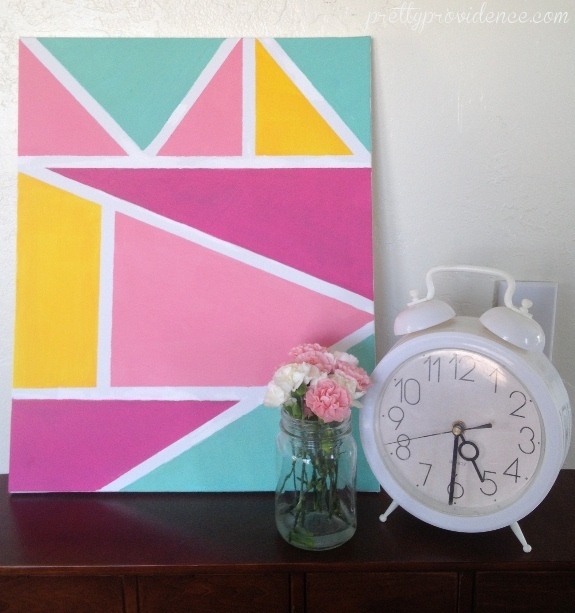 I made this easy DIY geometric wall art in less than two hours a couple of weeks ago. I was feeling a great need for some color around my house and I needed to get it quickly, and for cheap. I went to Hobby Lobby and saw that canvases were on sale, grabbed one for $3.50, and came home to start painting! 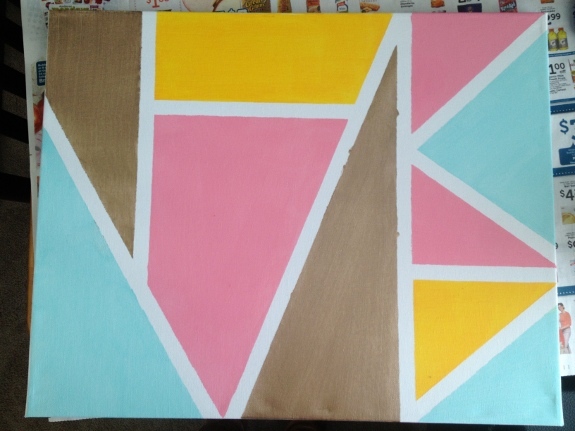 Make a geometric pattern on your canvas with the tape. I just started taping (without planning anything) and washi tape was easy enough to pull off and move to a better place until I had the pattern I liked. Start painting! Choose which sections to paint which color, and try not to let paint seep under the lines. As you can see, some paint did come outside of the line, but not for lack of trying to prevent it! That’s what the white paint is for. After my paint was mostly dry (about 45 mins) I decided I wasn’t crazy about the gold color, so I re-taped and painted those sections a raspberry pink color. Remove tape and make touch-ups as needed. Voila. You may notice that my lines are not totally perfect, but I found that the more I tried to make them perfect, the worse off they were. A couple times I just put more tape on and made a new line instead of trying to touch up certain spots. Less is more! I am tempted to buy a giant canvas (or old oil painting at a thrift store?) and do a big giant geometric art like this one. It was seriously so easy and adds so much to my room! Have you ever painted your own wall art? « Easy Way to Decorate a Birthday Cake & Favorite Recipe! Yes!! I love it. Just started painting again! Yay!!! So fun and easy and therapeutic! Love this! 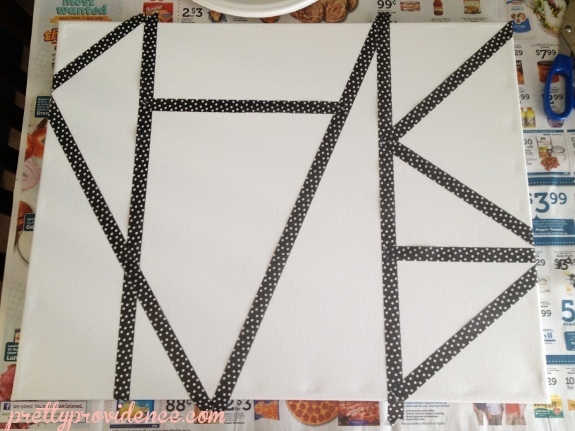 I’m planning to paint my own canvases with a geometric pattern so this was very helpful! You will love it. Seriously so easy! I really want to do this now for my house! I absolutely love yours! Really love this. I did some cheap wall art a few years back with fabric instead, but I’ll definitely have to try this one out. I love how this looks and all of the fun colors you used! So pretty!! The color combo and the pattern are just perfect! Beautiful! I like the darker pink better than the gold, too. Super cute idea. 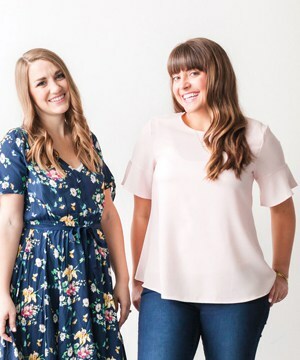 I’d be thrilled if you’d link up at this week’s Off the Hook! This is so awesome. I love the bright colors. So cool. I would love it if you would share this at my link party.